As a young girl in a working-class neighborhood of Sydney, Australia, Geraldine Brooks longed to discover the places where history happens and culture comes from, so she enlisted pen pals who offered her a window on adolescence in the Middle East, Europe, and America. Twenty years later Brooks, an award-winning foreign correspondent, embarked on a human treasure hunt to find her pen friends. She found men and women whose lives had been shaped by war and hatred, by fame and notoriety, and by the ravages of mental illness. Intimate, moving, and often humorous, Foreign Correspondence speaks to the unquiet heart of every girl who has ever yearned to become a woman of the world. 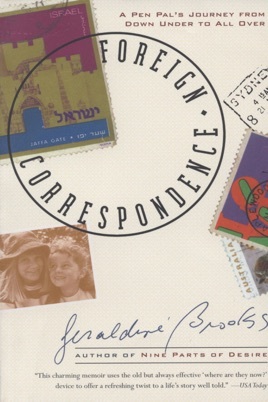 Growing up in middle-class Sydney, Australia, Brooks acquired pen pals from all over the world. More than 20 years later, after she became a foreign correspondent for the Wall Street Journal, she tracked down a few of them to see "how they had been treated by history...and to get in touch with" the child she herself had been. Brooks relates her search in this competent but unexciting memoir of her youth and what she knew of that of her pen pals. Two of these discoveries stand out: near Tel Aviv, she finds an Israeli who initially doesn't remember writing to her and when he does, he wonders why she has bothered to find him; the other, an Arab, living not far from him, is so warm and outgoing that Brooks feels he has "humanized the Arab world" for her. In New Jersey, she learns that one of her pen pals is dead but is welcomed by her mother; in a village of the Vaucluse, in France, one of her favorite correspondents has become a settled matron; in Manhattan's East Village, she discovers that another has become a nightclub owner. In the end, however, they remain people of more interest to Brooks than to the reader, who may find the journeys more intriguing than the arrivals.